St. John Neumann Regional Catholic School’s commitment to the learning process is reflected in a curriculum that adjusts to the unique needs of individual students while respecting the rights, interests, and personal dignity of each child. The school’s sound academic curriculum prepares students to become productive members of society in a world that is becoming increasingly competitive. 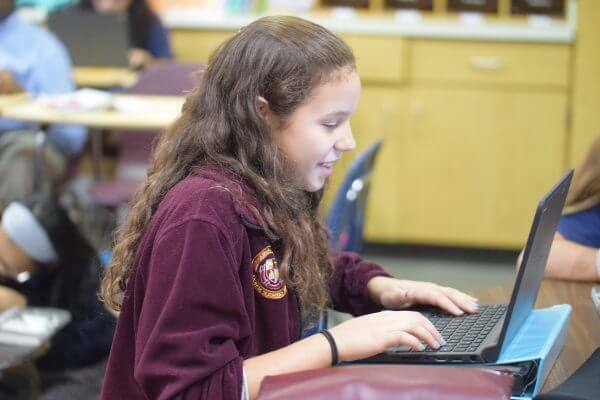 St. John Neumann uses a standards-based curriculum that was carefully designed by expert teams of teachers, administrators, and specialists from across the Archdioceses. It is a beautiful balance of classical education with 21st-century skills students will need to be successful in the future. St. John Neumann Regional Catholic School strives to meet the educational needs of all of its students in the academic spectrum. Children who need additional academic support outside the classroom may be referred to the Academic Coaching Program to provide strategies for each child’s success and is designed to meet the learning style needs of students. Coaching is available to those students who meet specified criteria. Early intervention is one of the goals of the program. Students meet in small groups with a concentration on reading and math skills, academic subject reviews, study skills, and test preparation. By challenging each student to do his or her best, the faculty ensures that students develop the skills necessary for success. This is evidenced by the exceptional performance of students from SJNRCS who go on to public, private, and parochial high schools with 100% acceptance to the school of their choice. This page provides an overview of the school-wide curriculum. To learn about the specific curriculum for each grade level please click on the sidebar menu. Religion is at the core of everything we do at SJNRCS. The goal of the religion curriculum is to instill in students an enthusiasm for living the Catholic faith and to provide an in-depth religious education that includes experiences in prayer, the sacraments, and service while stressing the integration of Christian principles into the total curriculum. Students celebrate special religious holidays like feast days of patron saints, Thanksgiving, and Christmas with pageants and programs. All grades participate in Lenten retreats. During these retreats, students are given time for quiet reflection, peer interaction, and self-evaluation, as well as the opportunity to bond with one another as a class. Students put their faith into action through participation in a class service project you can see each grades service project on their individual curriculum page. At Thanksgiving and Christmas, each class adopts a needy family to help provide a holiday meal. All students bring in fruit is which is collected and distributed by eighth graders to an Atlanta area soup kitchen. Religion is the thread that weaves faculty, staff, students, and parents together. The Language Arts curriculum incorporates reading, writing, speaking, listening, spelling, grammar, and vocabulary to assist students in the acquisition of useful language skills. Besides focusing on reading and comprehension, the reading series in elementary school undertakes a linguistic approach to reading that emphasizes word attack skills (phonics and decoding strategies), language skills, and vocabulary. An emphasis on vocabulary development begins in the primary grades. In middle school, the literature series and novels from different genres are used to integrate literary skills and reading skills. Middle School Language arts teach grammar skills and different styles of oral and written communication. The study of Mathematics as a means of exploring the world plays an integral role in the education of each student at SJNRCS. Mathematics enriches life and provides students with practical tools for daily living. Our program exposes students to a wide variety of mathematical experiences teaching to every style of learner. A hands-on approach to the basic mathematical ideas and concepts encourages children to experience mathematical relationships and interconnections and apply them to life. The Science curriculum provides students with a knowledge of science as it relates to them and their own experiences. The science program exposes students to a full range of activities through which science may be explored. Activities such as observations and data recording are ongoing. Science classes integrate and develop basic knowledge, investigative experience, and curiosity through student involvement. The school’s Social Studies curriculum begins with a hands-on program for Kindergarten. Our program includes technology at all levels in the presentation of material. Students begin with a study of their world, communities and regions, and their interactions. In fourth grade, students learn more about the regions of the United States and their development. 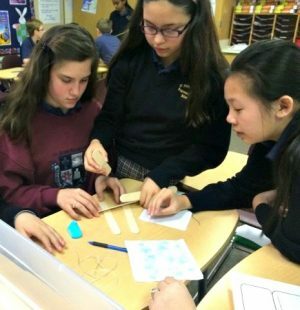 To further this knowledge, the subject of geography, foreign cultures, and world history in fifth and sixth grades introduces students to a variety of global issues. The study of American history and the U.S. Constitution completes the curriculum in grades seven and eight. In addition to core subjects, students attend weekly specials classes. The Fine Arts curriculum develops and stimulates the artistic abilities inherent in all children. Art and music classes develop many valuable skills, including physical and mental coordination, self-expression, group participation, and cooperation. An archdiocesan Arts Fair is held in the spring to showcase the talents of students from all grade levels. All students gain a working knowledge of computers through classes in the Computer Lab. A wide-range of software complements classroom instruction. Students learn proper keyboarding techniques, as well as various word processing applications. State-of-the-art multimedia computers enable students to conduct online research activities while utilizing technology skills to creatively enhance learning and communicate effectively. Computers within the lab and throughout the school are networked for both Intranet and Internet usage. Interactive whiteboards and LCD projectors are used by teachers in the classrooms to enhance their lessons.The school’s one-to-one student-device program in grades five through eight provide daily integration in all coursework. Fourth-grade students have access to a classroom set of Microsoft Surface tablets, and students in grades K – 3 have access to Android tablets. Spanish is offered to all grades at SJNRCS. Classes are conducted 99 percent in Spanish, with an emphasis placed on pronunciation. Students acquire vocabulary and learn sentence structure making connections through the use of media, visuals, and nonverbal communication. Students also learn about the culture and food of Spanish speaking countries. Physical Education assists in the development of physical, motor, and developmental skills while teaching the importance of teamwork and providing lifetime fitness techniques. Middle school students attend health and study subjects relating to mental and emotional health, personal health and physical activity, injury prevention and safety, nutrition and diet, concepts of disease prevention and control as well as consumer and community health. The school’s Media Enrichment Program provides a broad range of teaching materials that play an integral role in enhancing the school’s instructional program. Learning the use of these valuable resources helps to develop each student’s ability to conduct research and retrieve information.